Cuban officials and state media marked the recent celebration of the 60th anniversary of the establishment of Communist Party rule in China by emphasizing China’s economic might and the importance of bilateral ties. 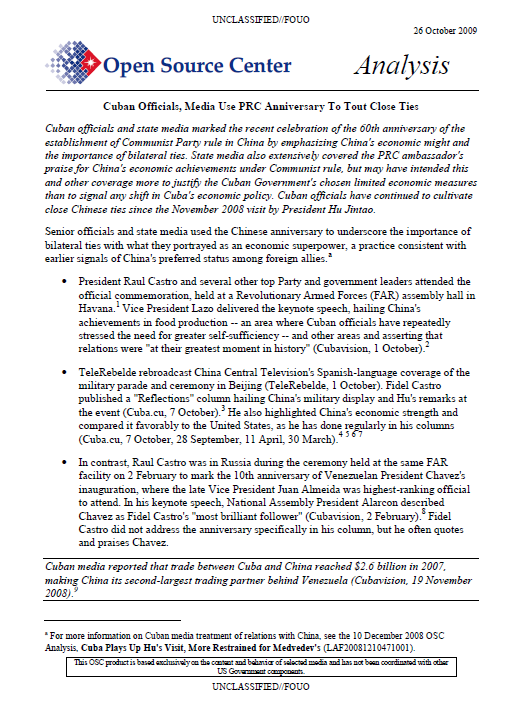 State media also extensively covered the PRC ambassador’s praise for China’s economic achievements under Communist rule, but may have intended this and other coverage more to justify the Cuban Government’s chosen limited economic measures than to signal any shift in Cuba’s economic policy. Cuban officials have continued to cultivate close Chinese ties since the November 2008 visit by President Hu Jintao. Senior officials and state media used the Chinese anniversary to underscore the importance of bilateral ties with what they portrayed as an economic superpower, a practice consistent with earlier signals of China’s preferred status among foreign allies. President Raul Castro and several other top Party and government leaders attended the official commemoration, held at a Revolutionary Armed Forces (FAR) assembly hall in Havana. Vice President Lazo delivered the keynote speech, hailing China’s achievements in food production — an area where Cuban officials have repeatedly stressed the need for greater self-sufficiency — and other areas and asserting that relations were “at their greatest moment in history” (Cubavision, 1 October). TeleRebelde rebroadcast China Central Television’s Spanish-language coverage of the military parade and ceremony in Beijing (TeleRebelde, 1 October). Fidel Castro published a “Reflections” column hailing China’s military display and Hu’s remarks at the event (Cuba.cu, 7 October). He also highlighted China’s economic strength and compared it favorably to the United States, as he has done regularly in his columns (Cuba.cu, 7 October, 28 September, 11 April, 30 March). In contrast, Raul Castro was in Russia during the ceremony held at the same FAR facility on 2 February to mark the 10th anniversary of Venezuelan President Chavez’s inauguration, where the late Vice President Juan Almeida was highest-ranking official to attend. In his keynote speech, National Assembly President Alarcon described Chavez as Fidel Castro’s “most brilliant follower” (Cubavision, 2 February).8 Fidel Castro did not address the anniversary specifically in his column, but he often quotes and praises Chavez.